Cypress stumps and knees of a once great wetland forest. The world’s attention will soon focus on Paris for the COP-21 climate treaty negotiations in December, where international negotiators will attempt to hammer out a treaty to address the rapidly growing threat of climate change. It is vital that we reevaluate our relationship with forests and upgrade our thinking for the 21st century – especially when it comes to the forests of the Southern US. We must seek innovative strategies to invest in the protection of natural forests and the restoration of degraded forests; instead we have opened the floodgates to new markets for increased logging in the region. Meanwhile, documentation that Europe’s conversion of coal plants to wood is accelerating carbon emissions and driving large-scale clearing of sensitive, biologically diverse wetland forests across the coast of the southeastern United States is making international headlines. The volume of wood pellet exports from this region quadrupled in the past several years. Projections of continued growth in Western Europe led by the UK – from 5 million tons in 2015 to over 35 million tons in 2020 – are staggering. European and British policy-makers and utilities have exploited a fatal carbon accounting error under Kyoto rules for calculating national GHG emissions, allowing countries to count CO2 emissions from burning trees and other forms of biomass as zero. The assumption is that because forests absorb carbon as they grow, eventually any carbon emissions emitted today will be removed from the atmosphere by future tree growth. Yet, scientific studies warn that this assumption is untrue given that burning wood releases more CO2 at the smokestack than fossil fuels and it can take decades for a forest to rebound after being cleared. With negotiations so focused on tropical forests, this major forest and climate issue is largely being ignored. The forests of the Southeastern US are the most biodiverse in the North America. When left standing, they are one of our best defenses against climate change. They remove and store vast amounts of carbon, and they protect water resources while providing storm protection. These forests are vital to the people of this region. 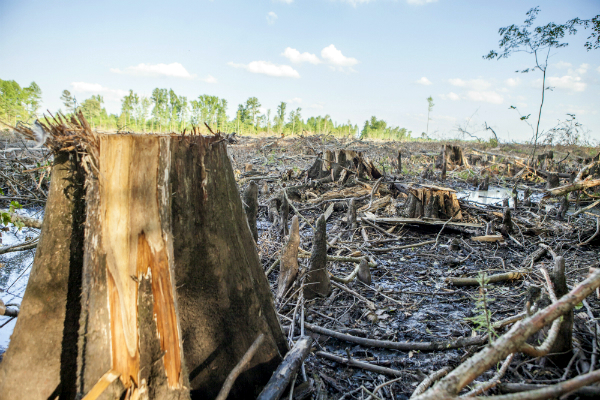 A recent analysis of NASA satellite imagery found that forest disturbance from logging in the Southern US is four times greater than in South American rainforests. Logging and burning trees to generate electricity is neither a path to a low carbon future nor to achieving broader sustainability. International negotiators and leaders in the EU need to require accurate forest carbon accounting and update their carbon emission reporting requirements to reflect 21st Century forest science. The US must commit to a major scale-up in the protection of its own forests. In order to be a global leader on climate, the US needs to clean up its own backyard, and the simplest path forward is to invest in conservation strategies that protect and restore our forests rather than incentivizing their destruction. We must value standing forests for their life-supporting climate, water, storm protection and biodiversity benefits. All the science is pointing to one undeniable conclusion: keeping forests across the globe standing is one of the smartest things we can do to ensure an inhabitable planet for ourselves and future generations. Global leaders can no longer ignore one of the most important climate policy debates of this decade – whether or not forests will become a primary fuel source for generating electricity, and they must recognize the importance of protecting forests outside of the tropics, such as those in the Southeastern US.